My Dad always used to say that. Technically, the ides of March is the 15th of March (the “beware” bit originated because this was the day in 44BC that Julius Caesar was assassinated in the Senate) but for me the ides seems to be coming a bit early this year. Okay, I am exaggerating - Caesar would argue that in comparison to his ides of March mine are going pretty well - and he would be right. I’m just not having a very good day today. I went in to wake up the 21st Century Teenager and found a very poorly boy, full of cold with a terrible sore throat and thumping head. He was not very well last night, but I had hoped that he would be a bit better this morning. As this is his GCSE (big state examinations) year, it’s worrying for him to miss any school at all, but the last time I encouraged him to try and power through an illness, the school sent him home and told me on the phone he was “very poorly indeed”. That can be translated from school speak to English as “You are a horrible mother sending your poor sick boy into school”. I was not risking that again. I took the 21st Century Teenager a drink and some medication, and settled him back down so he could get some rest. Meanwhile, the 21st Century Husband was virtually ready to go. In the end, I showered at the speed of light and rushed out the door with wet hair and only the barest minimum of makeup on. As I drove the car to the garage, I hoped I might not be noticed at that early hour of the morning, but believe me, there are loads of people to see you not looking your best at any time of day. I was particularly piqued to see an immaculately dressed, perfectly made up lady dropping off her car at the garage looking askance at me as if I was somehow letting the side down. I blushed scarlet and felt about two inches tall. The 21st Century Husband dropped me back off at home and headed on to work. Things ticked along okay for a while until he called to tell me that the car had failed its MOT because of a broken lightbulb over the number plate (which didn’t sound so bad) and the front break pads needed replacing (which did). A bit of labour and three hundred pounds later, the car passed its MOT. Ouch. By now the 21st Century Teenager had slept for a few hours and was looking decidedly better, so I decided to venture out to Pangbourne to run some errands. I parked and hopped out of the car heading into the pet store for bird food and peanuts for the squirrels. My purchases were so heavy I decided to pop them in the boot before continuing on my errands. As I opened the boot, I noticed a huge amount of scratching on the back driver’s side bumper (check out the photo above). Now, I’m the most careful driver I know and if I had hit something - particularly if I had hit it that hard (!) - I would have known about it. The trouble is the car is quite dirty from the country roads I drive on so I’m not exactly sure when this happened. Either the valet parking person on Monday damaged the car, or someone ran into it in one of the two car parks I parked in yesterday and did not have the decency to own up. Whoever it is, I hope they scratched their own car worse than they scratched mine. And I hope they get caught in a really long traffic jam on their way home, miss an important appointment, break out in spots and (if they are a woman) break all their fingernails. I know that is very immature and you should not get attached to material things, but I’m really gutted that my car is damaged. I have never loved a car as much as I love this one and I want to put a sign on it saying “I didn’t do this” or “Not My Fault” until we can get it fixed. It’s not the sort of thing you want to claim on insurance either because before we even start the “I have no idea what happened” does not give a very good impression. Added to this is the fact that my car is in the “fast car with big engine” insurance bracket and I don’t want to do anything to increase the premium. So that will be another few hundred pounds to get that fixed. Double ouch. Funny, though, how God has a way of tapping you on the shoulder. Suddenly I’m sitting here feeling grateful. None of the things I am worried about here are really that important. I mean, the 21st Century Teenager is hardly ever sick. When I went to the pharmacy to get something to make him feel better, the chemist went through a list of “does he have” ailments - all of which I could answer “no” to - that made me realise just how blessed we are. Diabetes, asthma, heart disease - nope, nope and nope again. That in itself is worth rejoicing about it. 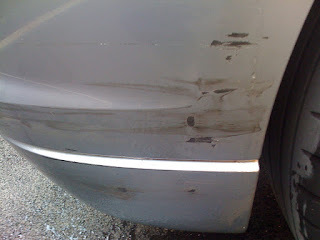 Furthermore, although my car is scratched, it is not dented, so the repair should not take too long and although it might be costly, at least it is fixable. Although I am not happy about spending the money on the repair, I do have the money to do it and won’t have to go without to get it done. Also, as I didn’t cause the damage, I have nothing to feel guilty for. And that’s before you get to the part about having a beautiful roof over our heads, enough to eat, gainful employment, a happy marriage, a great kid, people who love us and a really nice life. On reflection, I’m grateful to say that the ides of March are going really well here in the 21st Century Household. And I’m having a pretty good day after all.